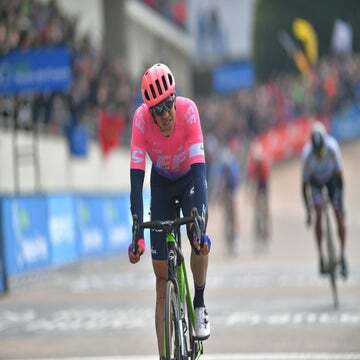 GENT, Belgium (VN) — For the second week in a row, Peter Sagan’s legs went missing in the late, decisive moments of the race, but that was better than Sep Vanmarcke (LottoNL-Jumbo), who was MIA in the final throes of a wild, wide-open Ronde van Vlaanderen (Tour of Flanders). In an eerie reprise of E3 Harelbeke, when he was popped out of the winning, four-man move within 5km of the finish, Sagan didn’t have the horsepower to help Greg Van Avermaet (BMC Racing) shut down the winning attack from Niki Terpstra (Etixx-Quick-Step) and winner Alexander Kristoff (Katusha). Van Avermaet dropped the stalling Sagan in the final 500m to round out the podium in third, but told Sporza on the finish line that if another, stronger rider had joined him in the chase, he believed he could have bridged across to the leading pair. And once again, the 25-year-old Slovak didn’t speak to the media following the race. And it appears not even to his own team PR staff. There were no quotes from Sagan in a post-race team press release. Tinkoff-Saxo sport director Tristan Hoffman preferred to see the glass as half full, and saw hopeful signs in Sagan’s brush with the podium. Can Sagan rebound for Paris-Roubaix, a race more punishing than the Ronde? After two, early-career appearances, he rode into the winning group last year, crossing the line a career-best sixth. With fourth at Milano-Sanremo and fourth at Flanders, time is running out for Sagan to win an elusive “monument” this spring. At 25 years old, he still has time to grow, but it appears Sagan has ran out of gas in his quest to win a big one in his first year of a multi-million-euro deal with Tinkoff-Saxo. The mood was darker around the LottoNL-Jumbo bus. Journalists were patiently waiting for sport directors to get a post-mortem of the team’s death on the pavé. 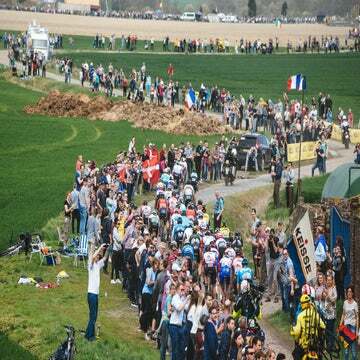 With both Tom Boonen (Etixx-Quick-Step) and Fabian Cancellara (Trek Factory Racing) out of the frame, this year’s Flanders was a chance for Vanmarcke to step boldly into the picture. At 26, he’s been nipping at the edges of a major breakthrough in the northern classics, riding in key moves in 2013 and 2014. This year, he’s clearly been a touch off top form. He got sick at Tirreno-Adriatico, and struggled to stay with the leaders in the closing kilometers of an epic Gent-Wevelgem last weekend. Despite those hiccups, the team was quietly optimistic that Vanmarcke was primed to deliver Sunday. Instead, the wheels fell off the cart late in the race. The big Belgian struggled on the decisive Taaienberg climb. Vanmarcke was caught out at the back of the fracturing peloton, and desperately tried to chase back on. Maarten Wynants paced him to the Kruisberg, and he came within 30 meters of the leaders, but that proved to be an unattainable chasm. He desperately chased alone, losing ground, and slowly his spirit. He drifted across the line at 53rd, his worst showing in four years. The Hell of the North is hardly ideal terrain for riders trying to rediscover their missing spark. Traditionally, most Roubaix winners hit the punishing, rougher pavé of northern France after solid racing across Belgium. Like it or not, both Sagan and Vanmarcke have reached the moment in their respective careers when anything short of victory will be considered a disappointment. And both will be riding into Roubaix with added pressure to post a result, but that goes for a lot of others as well. Etixx-Quick-Step and BMC Racing will both be champing at the bit for a big ride to cap their equally frustrating classics campaign. Bradley Wiggins (Sky) will be racing in his final major road racing event of his illustrious career. The tension will be sharper than a chunk of French granite.